You can use the CMI Library without creating a user account and have full access to all features except Bookmarks and Annotations. You still have access to them but having an account offers these additional benefits. When you are signed into your account and create a bookmark it is stored in the Cloud and is then available on any device you use to view the Library. When you are not signed in bookmarks are stored to your device and available only when using that device to view the Library. The practical effect of this is when you create bookmarks using your computer at home without being logged in and then access the Library from your tablet or phone at the coffee shop none of your bookmarks will be available and you will be given the message that you don't have any. You will have to create them again on your other devices. This doesn't happen when you create an account and sign in before creating bookmarks. This is why both the and menu options show red when you are not signed in and green otherwise. Bookmarks can be shared to Facebook and by email but only when they are stored in the Cloud. For this reason sharing requires you to be signed into your account. Learn more about sharing here. You must first create an account before you can sign in. Start by clicking the icon. Click the Sign up tab, enter your name, email address, and password and the press the “Sign up” button at the bottom of the window. An email will be sent to the email address you entered. Click the link in the email to continuing signing up. Click the link to confirm your email address. Notice that the account is created for The Raj Material. 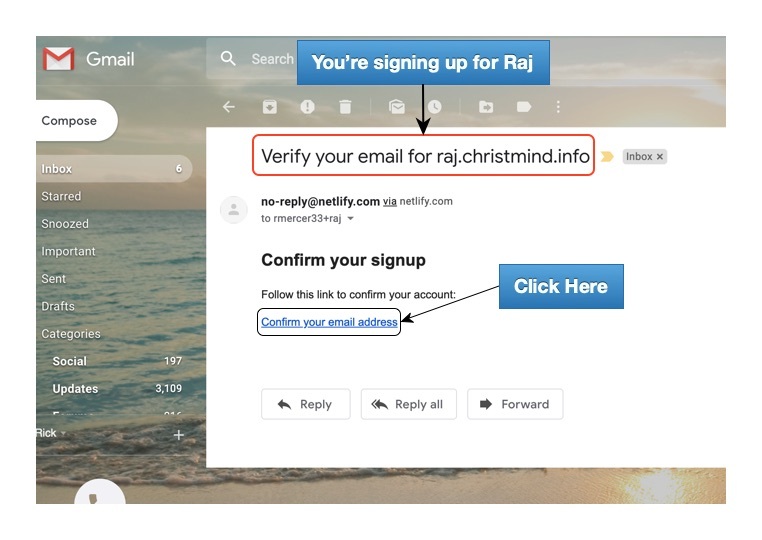 When you click the link to confirm your email address the landing page for The Raj Material will open and you will be automatically signed in. Unless you explicity sign out you will be automatically signed in each time you enter the site. When you hover the cursor over the icon, which shows green when your are signed in, your name will be displayed. Signing in is usually done automatically. You will need to sign in only when you access the site with a new computer or after you explicitly sign out. An account created when in The Raj Material, for example, applies only to the parts of the Library related to Raj. 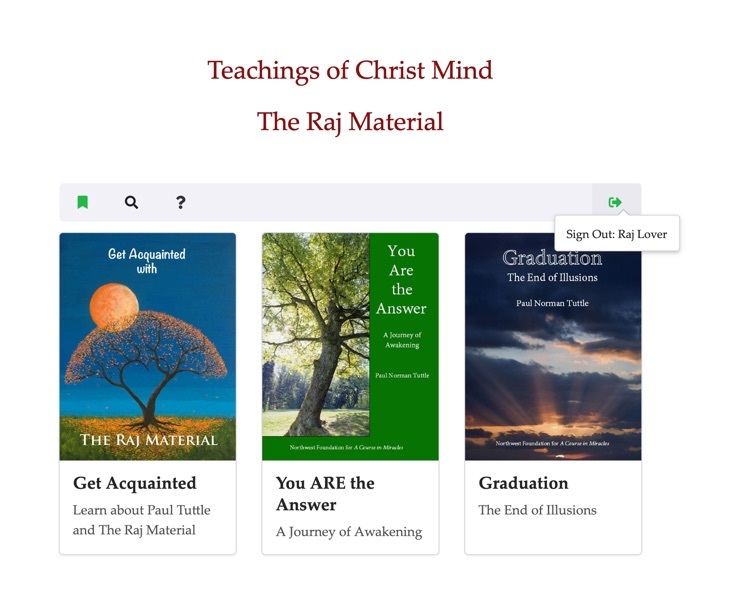 Other parts, such as The Way of Mastery and ACIM, are not included. 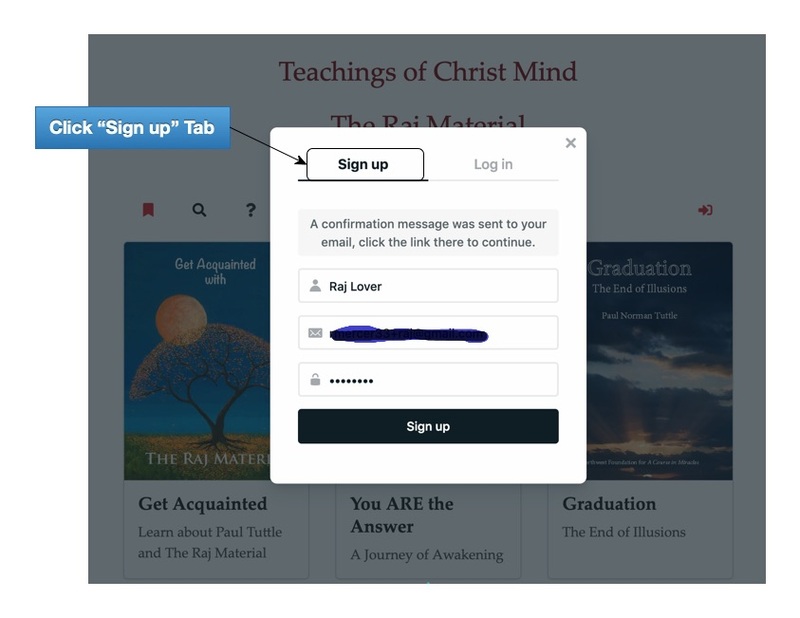 This means that you will need to create an account for each teaching necessary. Each account can use the same email address and password.